It’s a fact that any automaker who wants to maintain a significant market presence in the United States is going to need to have a crossover SUV in its product portfolio. After all, consumers can’t get enough of crossover-like vehicles. They have become the preferred mode of transportation for those looking for a people-moving and cargo-friendly transportation option. These utilitarian aspects are great, but pose a unique challenge for an automaker like Alfa Romeo. How do you maintain the brand’s high standards of style and performance while delivering what consumers want from crossovers? The good news is that the engineers from Alfa Romeo have done just that with the 2018 Stelvio. While we may be a bit biased, we firmly believe the Stelvio is by far the best-looking sport utility vehicle on the road. It offers unmistakable Italian styling along with incredible driving dynamics. You’ve got three trims to choose from in the 2018 Stelvio lineup: Base, Ti, and Quadrifoglio. If you’re looking for the ultimate Alfa Romeo experience from your SUV, then you’ll definitely want to go with the Quadrifoglio trim. It’s headlined by an ultra-powerful 2.9L V6 engine that delivers an astounding 505 horsepower. That’s not to say, however, that the Base or Ti trims come up short in the power department. After all, these are Alfa Romeo vehicles we’re talking about. Each and every 2018 Stelvio turns any long or short road trip around the Washington, D.C., area into an exhilarating experience. You know what we’re going to say next, right? There is no way to accurately capture the experience of the 2018 Stelvio with mere words. A test drive is a definite necessity. Why not head down to our Vienna, VA, Alfa Romeo dealership and get into a Stelvio today? You’ll be amazed at all the luxury, amenities, and performance you get with the 2018 Stelvio. 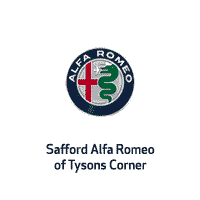 Safford Alfa Romeo of Tysons Corner product specialists will meticulously cover every feature on the sport utility crossover. They will also be in a position to present some attractive purchase and lease specials on the 2018 Stelvio. You absolutely have to experience this amazing vehicle in person, and we’re excited to have the opportunity to get you into one. Come see us at our Alfa Romeo store located at 8448 Leesburg Pike Unit A, Vienna, VA 22182. Alfa Romeo characterizes the 2018 Stelvio as an SUV “born from a racing pedigree,” but they also ensure that it comes incredibly well-equipped on the inside. Interior options include Nappa leather seating in a choice of three different colors: black, red, or chocolate. With a primary emphasis on performance, it should come as no surprise that the driver’s cockpit features an intuitively arranged and comprehensive control system. These controls include a 7-inch TFT display that provides vehicle performance and diagnostic information. You can complement the driving dynamics with a premium sound system experience in the 2018 Stelvio, as well. A 900-watt Harman Kardon® system cranks out crystal-clear sound with 14 strategically placed speakers inside the Stelvio. Alfa Romeo also made sure to include a suite of available safety technology with the 2018 Stelvio. These options include Blind Spot Detection, Adaptive Cruise Control, Forward Collision Warning Plus, and more. Muscular curves and sleek, flowing lines highlight the outside of the 2018 Stelvio. This vehicle definitely surpasses any other sport utility vehicle on the roads of Virginia in the looks department. An all-aluminum 2.0L turbocharged engine comes standard under the hood of the 2018 Alfa Romeo Stelvio. Step up to the Quadrifoglio version of the Stelvio and the performance dynamics go through the roof. With the Quadrifoglio, the twin-turbocharged 2.9L V6 engine will provide road-burning 505 horsepower along with 443 lb-ft torque. All-wheel drive is standard on the 2018 Stelvio no matter which trim level you choose, along with a DNA Drive Mode Selector system. This innovative feature on the Stelvio allows you to change the composition of the Stelvio’s driving dynamics system. Based on the mode selected (Dynamic, Natural, Advanced Efficiency), the 2018 Stelvio will adjust steering assist, braking response, and shift timing in the vehicle. Why Choose Our Vienna, VA, Alfa Romeo Dealership? You’ll find the complete line of Alfa Romeo models along with some incredible purchase and lease specials at our dealership located at 8448 Leesburg Pike Unit A, Vienna, VA 22182. Let our product specialists introduce you to the Alfa Romeo product and all its exciting features and performance.